Bee Gees singer Robin Gibb has pulled out of a series of shows in Brazil after he was taken to a British hospital with abdominal pains. Gibb fell ill on Sunday and was advised not to travel by doctors. "We are not sure what's wrong with him at this stage and are worried," his spokesman said. Last year Gibb had surgery for a blocked intestine. His twin brother Maurice died in 2003 due to complications from a twisted intestine. 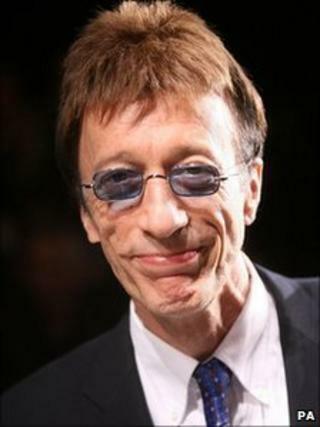 While performing in Belgium last year Robin Gibb suffered stomach pains. Emergency surgery resulted in the singer having part of his intestine removed. His spokesman said the 61-year-old had been "extremely healthy" since the operation. Gibb, an Isle of Man resident, had been scheduled to play several concerts across Brazil in such cities as Sao Paolo and Brasilia before being taken ill.
"We don't know if it is a recurrence of the previous problem or if it is something else entirely," his spokesman continued.